As the year end school holiday comes closer, many has planned to travel abroad for sight-seeing and for a soul-rejuvenation. 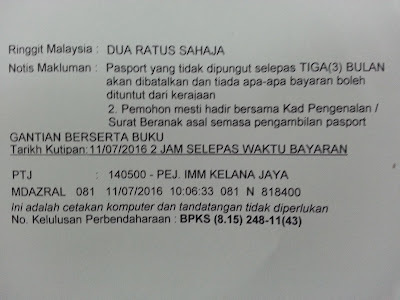 It could be first time for some of the travel groups and in this post, I am going to start from the basics ; Making (or renewing) your Passports as a Malaysian citizen. In the past, there are many processes (and not to mentioned, Complicated) required in order to get your passport done. 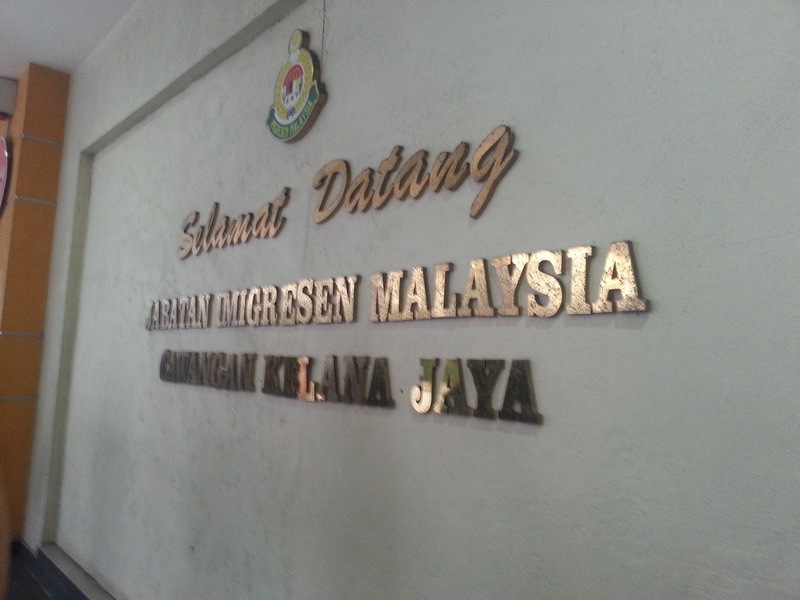 However, starting 15th January 2015, the Immigration Department of Malaysia has reviewed the fees of passport renewal with a couple of changes in management. It used to be RM300 for 5 years (RM150 for senior citizens and children) and different fees for the number of years you want to renew but now, you can save even more! The previous 2 years of passport renewal period is no longer available. 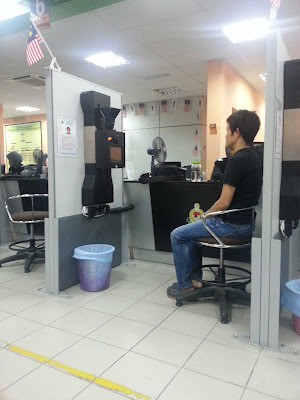 There is no need to prepare your passport pictures before hand too. Yeay! No need to download and print any more forms from website! 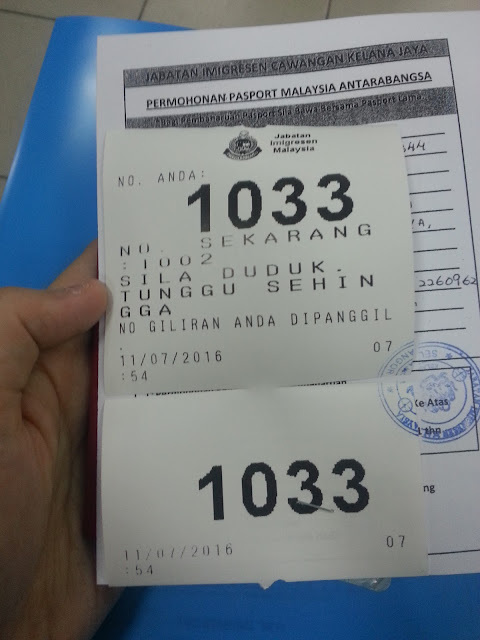 I was given a ticket at 7.54AM and was attended at the counter at 9.49AM. On average, each individual will take 6-9 minutes to submit and signing of documents along with photo-taking. My record was 2 minutes. At 10.06AM, I made a cash payment of RM200 (American Express, Visa and Mastercard are accepted as mode of payment too). Apparently, they do not issue the receipt right after your payment. I was called to collect my receipt at 11.31AM and to collect my passport at 11.33AM. 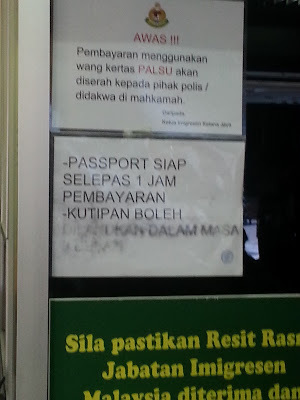 Notice stating Passport will be ready 1hour after payment. Although it is stated on the payment counter that the waiting hours for passport collection would be approximate 1hour, in reality it took me 1hour and 30 minutes. This could probably due to shortage of staffs after the long public holiday. Some of my friends manage to complete the entire process in just 1hour and 30 minutes and here are some tips to make your life easier. 1. Reach the Immigration Offices early (Best before 6AM) if you want to make it into the limited quota of the day (which is set at smaller Immigration Offices). I reached at 6.35AM and there is already close to 40 people before me. My cousin who arrived at 6.50AM however wasn't as lucky as he didn't make it into the first 100. As a matter in fact, he had to return to the same office 5 times to get things done. 2. Renew your passport on a WEEKDAY and definitely NOT right after a Public Holiday. I thought the line would be less as most people would probably have returned from their trip. Boy, was I wrong. 3. Prepare your documents (IC, Old Passport, forms, etc) in your hands before your number is called. Fumbling in your bag searching for the required documents is a waste of your and others time. 4. Dress for the event. Clip up your fringe or gel your hair neatly to avoid unnecessary embarassment of spraying your hair with a water spray bottle. Collared dark semi formal shirt with sleeve is a safe bet to qualify for the photo taking session. Otherwise, you may need to put on one of those public-shared formal coats. 5. Go to the Immigration Department Headquarters such as the one in Cyberjaya or any Urban Transformation Centre (UTC) in KL for passport renewal. It is expected that headquarters to perform more efficiently and at least they do not have quota of passport released per day. Unless they are situated out of reach and not worth of travelling cost, then I would suggest to bring along something such as a book to keep yourself entertained. 6. Pray the Passport system does not fail on the day you go. Otherwise, you may end up like how my cousin did. 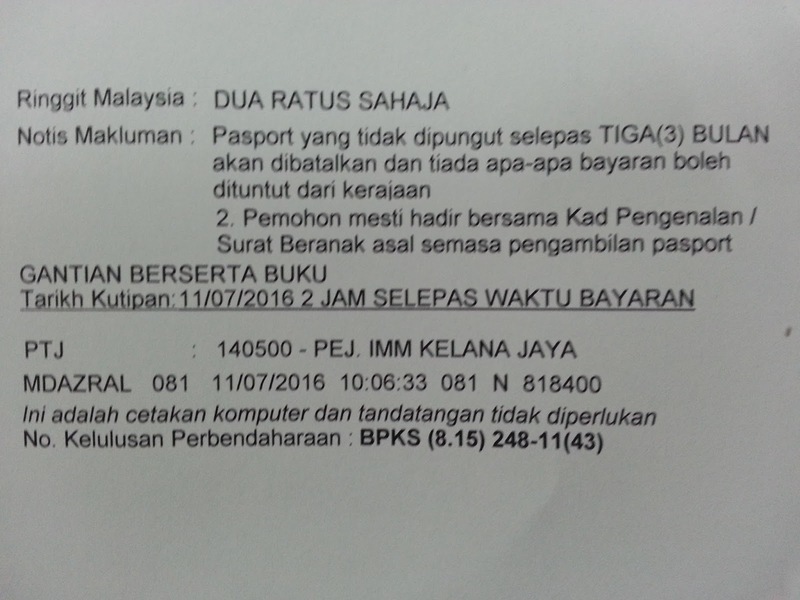 There are rumors stating that passports can be renew online at the Immigration Department of Malaysia website starting 1st September 2016. I have not tried this out as I done mine in early July, but it is really useful for those who wish to skip the line. Do let me know if you have tried it out. I hope this post will help you in renewing your passport an easier one.